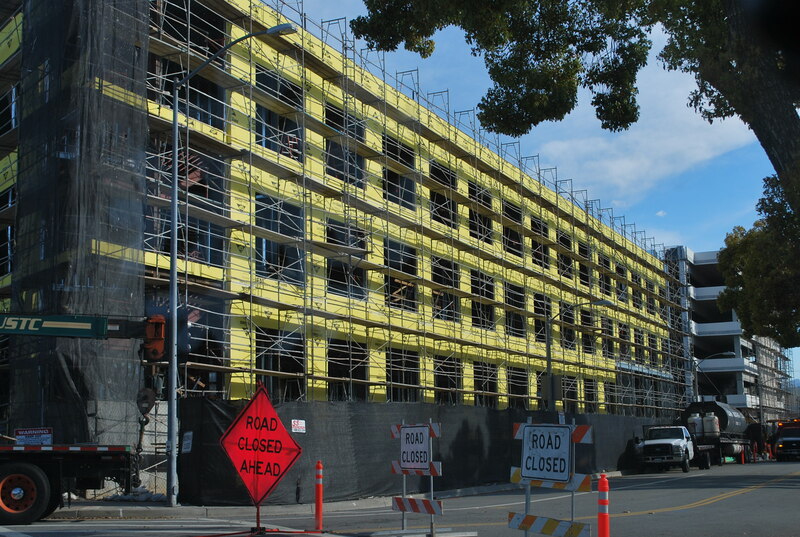 Is a new building the most sustainable choice? Buildings are our most significant consumer products. Yet, every day, these structures are demolished—often in the name of environmental responsibility. Over the next 20 years, Americans will demolish over one-third of our building stock (over 82 billion square feet) in order to replace seemingly inefficient buildings with energy-efficient “green buildings.” Is demolition in the name of sustainability truly the best use of natural, social and economic resources? The award-winning film, The Greenest Building explores this question with noted preservationists, architects and green building consultants discussing the environmental impact of demolition, the needs of communities to reflect a “sense of place,” and the proposition that the greenest building may, in fact, be the one that is already built. The film showcases examples of creatively repurposed historic buildings that have been upgraded to LEED standards, serving their owners and occupants as 21st Century workplaces while preserving the unique character of their surrounding communities. Alhambra Preservation Group will present a screening of The Greenest Building, followed by a discussion by a panel of experts from the fields of architecture, historic preservation and urban planning. The screening and discussion will take place at 7:00 p.m. on Thursday, March 15 in Reese Hall at the Alhambra Civic Center Library, located at 101 S.First Street. All are welcome to attend; the event is free and open to the public. Light refreshments will be provided. Ample parking is available, at no charge, in the library’s underground parking structure. For more information about the showing of The Greenest Building or to RSVP, please call (626) 755-3467. * Photo Courtesy of Alhambra Preservation Group. 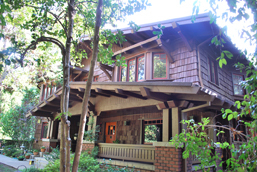 A beautifully handcrafted 1911 Arts and Crafts home located in the northeastern corner of Alhambra was among four residences honored with an Alhambra Preservation Group 2011 Heritage Home Award at a November 2011 ceremony. “We are proud to recognize the owners of this home for their responsible stewardship of Alhambra’s architectural history,” said Christine Olson, APG President, in presenting the award. The first owners of this 100-year-old grand Craftsman home were James and Abbie Reid, who lived here with their two daughters, Ruth and Irma. 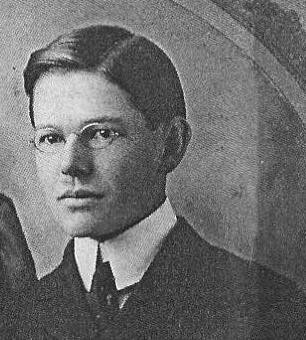 Mr. Reid was a Los Angeles banker and fruit grower and helped to organize the Semi-Tropic Fruit Exchange in 1893 – a growers’ cooperative that later became known for its Sunkist brand. In 1911, the Reid family bought eight acres of land in the original Alhambra Tract and built an elegant two-story home in the northeast corner of their property with the help of Los Angeles architect Arthur Acker, whose residential designs reflected his admiration of famed Craftsman architects, Charles and Henry Greene. The Reids planted their surrounding acreage in Valencia and navel orange trees, and situated the ranch so that it was immediately adjacent to both the Southern Pacific rail line and the Alhambra Packing House. Sadly, the Reid family was not able to enjoy their home for long. Mr. Reid was killed in a streetcar accident in 1913, and his widow sold the home to John and Florence Sesser in 1918. John Sesser was a railway executive and real estate speculator who was very active in the early days of the Alhambra Board of Trade. The Sesser family owned this home until Florence’s death in 1965. When the current owners purchased the home in 2003, there was a great deal of rehabilitation work to be done, with the most immediate problems involving the plumbing and electrical systems. After upgrading these two major systems, the real work began in 2009 and literally involved raising the roof so that badly damaged original rafter tails and exposed beams could be replaced, and a new roof installed. Finally, all of the home’s exterior shingle siding was removed so that the walls could be fully insulated for energy efficiency. The original shingles were then turned over, reinstalled and stained so that their un-weathered side is now exposed. Interior improvements to the home were also part of the restoration work and included a remodel of the kitchen, downstairs bathroom and butler’s pantry. With improvements both inside and out, this stunning Arts and Crafts-styled home is now ready for the next 100 years! 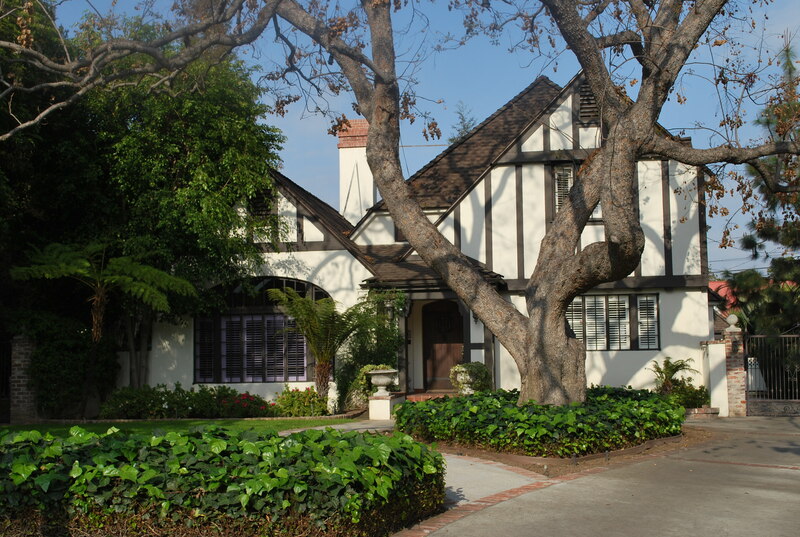 An elegant Tudor-Revival home located in northern Alhambra was one of four residences honored with Alhambra Preservation Group’s 2011 Heritage Home Award at a November 2011 ceremony. “We are honored to present this award to the owners of this home in recognition of the time and care they have invested in the preservation of this historic home,” stated Christine Olson, President of the Alhambra Preservation Group in presenting the award. This home is located in an area of Alhambra that was once known for its productive (and prosperous) commercial orange groves. The 10-acre Orange Blossom Manor Tract was planted by the father-son business team of Nelson and Elmer Bailey. The Baileys were experienced orchardists when, during the very early 1900s, they moved to Alhambra from Florida and established their Golden Pheasant brand. By the 1920s; however, the citrus industry was in decline in Southern California and the Bailey-owned orange groves were subdivided into housing tracts. 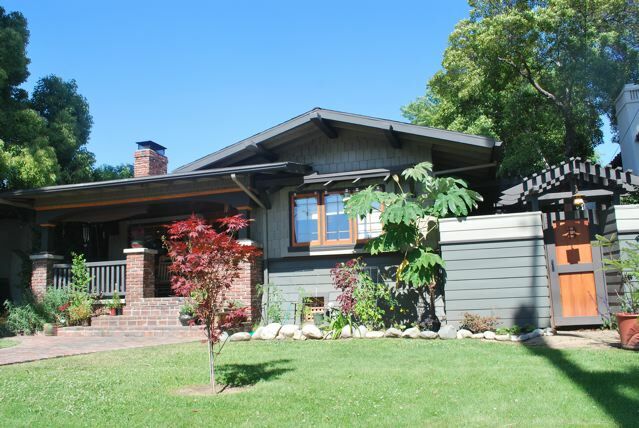 When this home was built in 1927 by Harold and Georgia Marriett, the total assessed value of the property was $5,740. While the identity of the Marriett’s architect is a mystery, the builder was Arthur A. Tennyson of Alhambra. Originally from England, Tennyson immigrated to the United States in 1881 and was a master builder of both homes and ships. Tennyson was also responsible for building the bath house, pergolas and municipal buildings at Alhambra Park, Alhambra’s first public park, which was officially dedicated on July 4, 1921. Harold Marriett was a purchasing agent for the Alhambra-based Standard Felt Company when he met his second wife, Georgia, a stenographer for the same company. They married in 1925 and purchased this site for their new home in 1927, presumably because it was just a few lots north of Georgia’s younger sister Madelyne’s residence. The Tudor-Revival home that they built was meant to impress. A very popular residential style in the post-World War I housing boom, the popularity of the Tudor-Revival style continued throughout the Great Depression. Elements generally incorporated into these homes included steeply pitched roofs, front-facing gables, ornamental half-timbering, prominent brick chimneys and tall mullioned casement windows—all of which are featured in this picture-perfect house. While they lived here, Harold Marriett owned a successful printing business in Los Angeles. The Marriett family continued to own this home until 1970. The current owners purchased this home 10 years later in 1980. They fell in love with its character-defining features, which are rarely—if ever—found in new home construction. Their many renovation projects have included the addition of central heating and air conditioning, replacement of the home’s original plumbing, seismic retrofitting and the addition of a bedroom and bathroom, all accomplished in a way that both respects the home’s historic character and enhances its value. 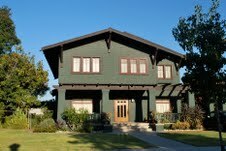 On November 3, 2011 Alhambra Preservation Group honored a stately 1909 Arts & Crafts home located in northwestern Alhambra as one of its four 2011 Heritage Home awardees. Many of the local history and architecture lovers who attended APG’s June 2011 Historic Home Tour will recognize this home as one of the homes showcased by that event. 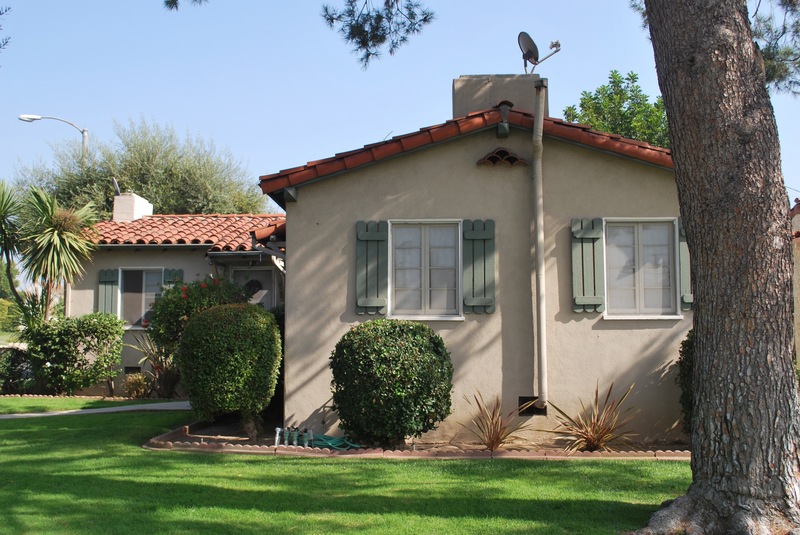 “We are honored to present this award to the owners of this home in recognition of the loving care and attention they have invested in the preservation of this Alhambra landmark,” stated Christine Olson, President of the Alhambra Preservation Group in making the award. 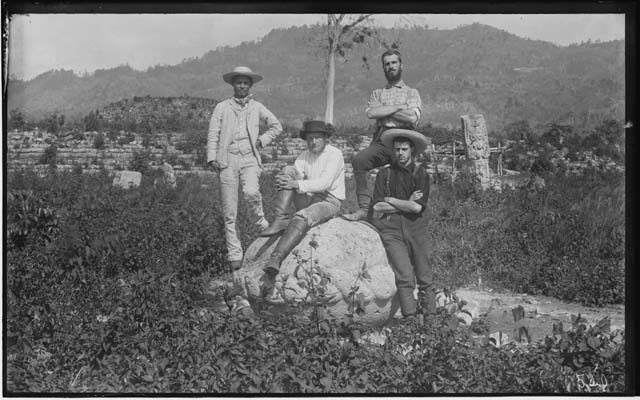 Edmund Lincoln (upper right) in Honduras during the 1883 archeological expedition. This home is located in Alhambra’s La Marguerita Tract. Its story begins with an adventurer and world traveler. Edmund Lincoln, a Harvard graduate, was a member of a pioneering 1883 archeological expedition to Central America. Sponsored by the Boston’s Peabody Museum, the mission of this ethnographic study was to explore and document findings about the Mayan people and their culture, about whom little was then known or understood by academia. As the expedition’s photographer, Mr. Lincoln produced more than 10,000 glass-plate negatives documenting Mayan artifacts and people. Lincoln’s photographs are still in use by researchers and histories and formed the centerpiece of a 2009 exhibit at the Peabody Museum. Following his Central American adventure, Lincoln settled in Pasadena where he met and married his wife Jessie in 1900 and they began a family. Over the next several years, the Lincolns invested in large tracts of land in the fashionable Westlake District of Los Angeles, Alhambra and the then-rural area of Sierra Madre. They purchased the land in Alhambra from Adolph Graffen, whose early 20th Century farmhouse still stands on Pine Street. The Lincolns never lived in Alhambra. They were land speculators who made a smart investment in a new “streetcar suburb,” developing their tract into 33 parcels that were sold to homebuilders. Rumor has it that both the La Marguerita Tract and Marguerita Avenue were named after Adolph Graffen’s eldest daughter, Marguerite. In 1909, the lot was purchased by a young couple, David and Mary Sturges, who immediately secured the services of Smith-Weaver Construction to build this large, impressive home for their family and servants. Upon completion of the home, the total assessed value of the property was $1,700. Originally from the Midwest, David had come to Riverside County in with his parents in 1889. David’s father, a physician who established the first medical practice in Murrieta, employed David in the family’s drugstore and clinic. There, he must have learned skills that would later prove valuable to him when, living in Alhambra, he worked as an accountant for a local manufacturing company. During that time, he was also enrolled in an engineering program at Throop Institute of Technology in Pasadena—now known as Caltech. In the 103 years since this home was built, five families have lived here, but none longer than the present owners, who bought the home in 1978. Over the years, they engaged in extensive and painstaking restoration involving nearly every part of the house. 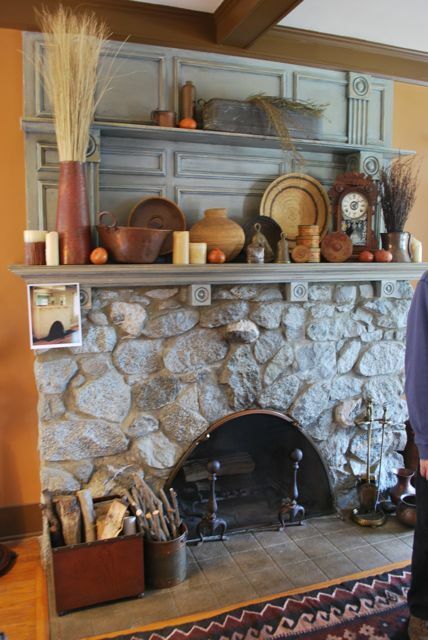 One of the most remarkable discoveries during that process was the home’s original river rock fireplace. At some point in the home’s history, the fireplace had been covered with smooth plaster, probably in an attempt to give it a “Spanish look.” After chipping away some of the plaster, the hidden treasure was revealed. So inspired were the homeowners by their discovery that they rebuilt the fireplace completely, using its original stones. Members of APG’s Board of Directors expressed their particular pleasure in honoring this property, the former home of Alhambra Preservation Group’s late co-founder, Katherine Hildreth. Welcome to a new year and to Alhambra Preservation Group’s new blog The Prose of Preservation. APG has come a long ways in just five short years. In 2007, Alhambra Preservation Group established itself as a non-profit organization dedicated to educating people about and advocating for the preservation of Alhambra’s architectural heritage. With bi-annual home tours, annual ice cream socials, countless Heritage Home Award winners, and a Facebook following, we’re ready to introduce the next step – a blog. As we all know, a blog is a great way to communicate with folks, and we’ll use this site to do just that. We’ll include articles about upcoming APG events, Alhambra’s fascinating history, APG’s Heritage Home Award winners, educational series, and the popular I SPY feature which debuted on our Facebook page last year. But, more importantly, a blog is the perfect way for you to join the growing conversation in Alhambra about preservation and we hope you do that as well! So, check back often. We’ll do our best to keep it fresh and engaging. We look forward to chatting with you about the pros of preservation here at The Prose of Preservation.